News of the sinking of Titanic still resonates with us today (photo ITV). The 100th anniversary of the sinking of the Titantic is approaching on April 14, 2012. As a professional marketer who loves a great promotion, I will bet that this year will see a flurry of fabulous events hosted in cities around the world. As a foodie I see it as another way to gather and entertain friends. Food lovers have been hosting dinners for years, but if you want to host a party of our own, this would be the year to do it because of the anniversary. Ironically, Titanic is on the minds of many with the photos and videos circulating about the January 13th grounding of the “unsinkable” Costa Concordia. Downton Abbey fans may also feel a new connection to Titanic for a couple of other reasons. 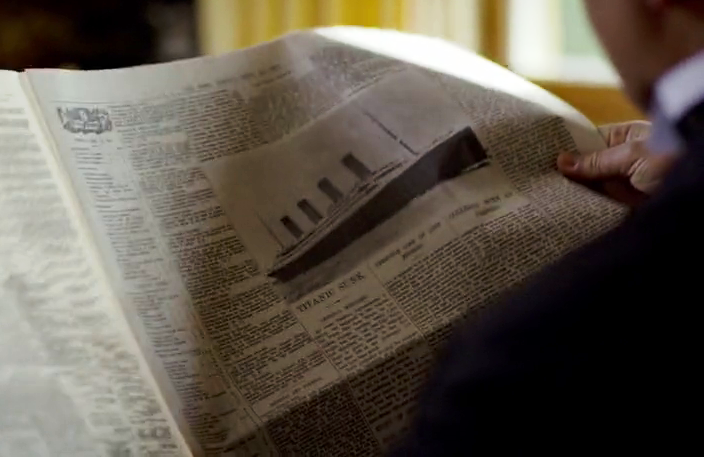 The show opens with news of the sinking of the ship which directly affects the Crawley family. Fans of Julian Fellowes will be hungrily anticipating the release of the new itv series Titanic 2012, which will start airing in this Spring in the UK. It is fortunate that menus survived the disaster, and I hope my blog will help you in your preparations. Come to this page to keep track of the First Class Menu. I also have the separate menus for 2nd class and third class or “steerage”. I attended a steerage party years ago and it was a blast. If you see red text, that means I have linked to other posts with my favorite traditional recipes. I hope you can handle some of the items such as celery and boiled rice and potatoes on your own. 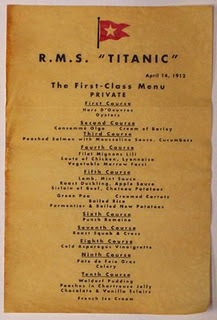 The tradition of these meals is to pay homage to the passengers and crew who were aboard Titanic. If you sadly miss the big day, don’t despair, you can take comfort in some fabulous Edwardian dishes which you can fit into any dinner party, even a Downton Abbey viewing party. Consider you are at sea on the frigid Atlantic ocean for days (the Titanic struck an iceberg on the evening of its fourth day) which will definitely keep you inside, day and night. I think a marathon 10 course dinner, plus fruits and cheeses would be just the ticket to keep you occupied for hours. The items in red below are links to recipes scattered throughout this site. If you are attempting this dinner, you should have a game plan, so click here for some ideas on your approach. Unless you are part of a historical/foodie group the full menu can be quite ambitious to attempt. Dana McCauley in Last Dinner on the Titanic, has great a suggestion for reducing the number of courses and still enjoy the food fashion of the era. Recipe by Dana McCauley from Last Dinner on the Titanic. Fish was a favorite dish of the Edwardians. This salmon course was served as the third course in 1st Class. The salmon can be served hot or cold. In large shallow pot, heat court bouillon until just below boiling point. Using a slotted spoon or spatula, gently place salmon into bouillon. Add water if needed to completely cover the fish. Poach fish for 3-5 minutes or until opaque on the outside and still coral-colored in the center. Prepare the Mousseline sauce. Using a spoon, skim froth from the surface of the melted butter and discard. Allow butter to cool slightly. On top of a double boiler or heatproof bowl, whisk water and egg yolks together with salt and pepper for 30 seconds or until pale yellow and frothy. Over barely simmering water, whisk mixture for 3 minutes or until it draws a ribbon for 5 seconds. Remove pan from heat; whisk in warm butter, 1 tablespoon at a time, until sauce begins to thicken. Still whisking, pour remaining butter into sauce in a slow steady stream. Stir in lemon juice and dill. Allow the sauce to cool slightly. Gently fold in whipped cream. Adjust the seasoning to taste. Keep warm by setting over a pot of warm water. 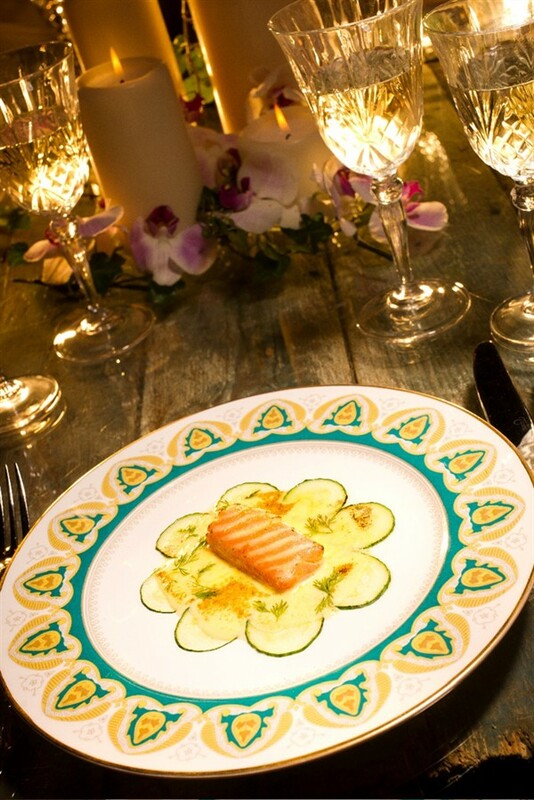 Arrange poached salmon on warmed plates. Spoon sauce down center of each piece of fish so that the border of the flesh remains visible. Top each fish with 5 slices of cucumber and top the cucumber with more sauce. In a large pot combine all the ingredients and bring to a boil over high heat. Reduce heat and simmer for 30 minutes. Strain. Keeps tightly covered in refrigerator, for up to a week. If you do want to try other recipes, and particularly if you are a cook book collector, you may wish to grab a copy of this great cookbook, Last Dinner on the Titanic. Canadian celebrity foodie Dana McCauley, did an amazing job bringing Edwardian cuisine to life. No judgement here if your idea of tribute is buying a new copy (who did I loan our copy to?) of the big picture Titanic (Widescreen) with a bag of popcorn (they did eat popcorn in those days). I’m preparing to host a 20s inspired birthday dinner party and this post just provided my menu! (Provided my chef is OK with that. LOL!) Thank you! !